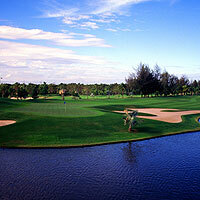 Thai Country Club sets the standard for golf course service excellence in Thailand. Owned and operated by the Peninsula Hotel group, expect nothing but the very best in all aspects of golf course operations at Thai Country Club. One of just a few courses in Thailand that knows how to treat their customers, golfers are overwhelmed with the high standards of service and quality from the moment you drive up to the bag drop, to the time you leave. The course is not surprisingly kept in pristine condition and is suitable for all levels of discerning golfers. The golf course is a little over-rated and while there are a couple of memorable holes, it's the five-star service that keeps people coming back. Handheld GPS devices dial in exact distances for you and the caddies are a class above anywhere else. Expect the same standard of service and facilities you would from one of the world's best hotels. The locker rooms are equipped with showers boasting 7 different nozzles. The caddies are used to tips a little (read:a lot) more than most courses in Bangkok. Notes: Members only, but playable if booked through Golfthink. Non-golfers not allowed on the course.